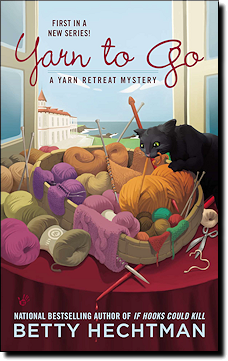 It is very exciting to be writing two national bestselling mystery series, and even better that they are both about yarn craft. One of the bonuses about writing the Yarn Retreat Series is that it has inspired me to develop my knitting skills. I love the idea of being bi-stitcheral. Now when I travel, I carry a set of knitting needles along with a selection of crochet hooks and projects in both yarn crafts. And now I have an even bigger excuse to add to my yarn stash! So, what is a yarn retreat? Picture going off to a rustic and slightly creepy hotel and conference center on the tip of California's Monterey Peninsula. Fog rolls in and waves crash against a rocky shore. A group of yarn enthusiasts gather to spend a long weekend learning new things, getting to know new people and having lots of time to work on yarn projects while curled up in front a cozy fireplace. And then wouldn't you know, all that peace is marred by murder. Just like the Crochet Series, there are dead bodies, but everybody has a good time. And all the books include a pattern and a recipe for one of Casey's famous baked treats. 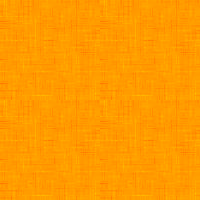 "Yarn to Go" Began the Series! "A cozy mystery that you won't want to put down. It combines cooking, knitting and mjurder in one great book!" "What a great start to a new series...This was a real page turner." "This is one of those books with a comfortable tone that flows evenly and the more I read in this lighthearted whodunit, the more the suspense kept me turning the pages as I needed to know how it was going to end." "The mystery is extremely well presented and woven through the entire story with ease. There really are three deaths and they may or may not be connected. It was really very interesting to follow all the clues and put everything together. 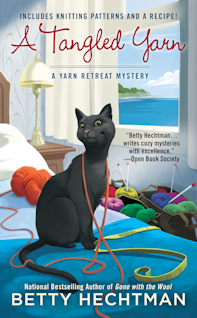 Hechtman is also the author of The Crochet Mysteries that feature Molly Pink, and an avid crafter so she knows what she is doing in the cozy mystery department. She has not only given us a wonderful story to kick off this series but has laid the groundwork for many more installments."